Although the design of aluminum based printed circuit boards (PCBs) is no different from that for a traditional FR-4 board, the similarities are limited to the imaging and wet-processing operations. To make the design cost-effective and manufacturable, an additional secondary mechanical operation is necessary. Additional considerations are necessary for the solder mask, legend printing, and mechanical fabrications. PCBs constructed with a metallic support base separated by a thin dielectric from the copper conductors of the circuit are also called Insulated Metal Substrates (IMS). Usually, aluminum is the choice for the carrier material because of its lower costs compared to other metals. The dielectric separating the substrate from the conductors has substantial influence on the total performance and it determines the thermal resistance. Depending on the requirement, the dielectric can comprise layers of filled or unfilled epoxy resins. Although filled resins offer a 3-10-fold higher thermal conductivity as compared to that from FR-4 material, this depends on the filling material and the quantity used. Additionally, the filling material influences the cycle resistance of the board. One of the major considerations the designers face with IMS PCBs is the coefficient of thermal expansion or CTE. As the board transfers heat to the metal part, it expands at a rate different from that of the dielectric and the copper traces. The differences in CTE between the various constituents of the PCB create stress on the solder joint. To minimize the effect, copper is preferred to aluminum as the base material, as it has a lower CTE. However, this increases the cost of the PCB. Other design variants include IMS with exposed copper, and aluminum with thin insulation layer. IMS with exposed copper is an optimized variant. Here, the metal of the copper substrate protrudes partially through the insulation layer, and there is no insulation to impede the transfer of heat. Therefore, electronic components can operate at higher currents or higher power levels. However, this requires the connected thermal contact points to be electrically neutral. Aluminum with a thin insulation layer is a modified form of IMS technology, where a thin layer of ceramic or aluminum oxide is used, rather than the dielectric made of epoxy resin. Depending on the application requirement of dielectric strength, the layer thickness may vary from less than 40 µm to 125 µm. This helps to achieve thermal conductivities of approximately 2 W/mk. Special design rules may apply for your aluminum PCB dependent on the purpose of the PCB and the outcome you are wanting to achieve with your specifications. 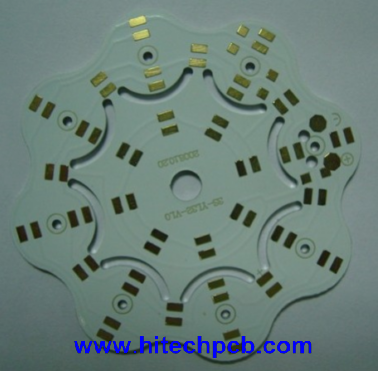 Standard aluminum PCB’s can be ordered online on our website www.htmpcb.com or for any requirements outside the online capabilities, please email your design file to sales10(at)hitechcircuits(dot)com.